We reached London from Mumbai at around 7:30am. Vivinmama was already outside waiting to pick us up. It was very sweet of him to come pick us up on Saturday morning especially because Heathrow airport was about 2 hours from his house in Northampton. As per the plan we were going to stay with Mohan aajoba and Naluaaji’s place for 1 day which was in Northampton as well. On our way to Northampton we talked a lot about general stuff like work, travel plans, leant a little about Vivinmama’s work life, his 2 daughters, their careers etc. He took us to a very European small village named Stoke Bruerne. Very picturesque little town. Here, we were introduced to this system of dams which hold water at different levels and if you wish to pass thru the river in your private boat, you can just open the dam wing manually, lower the water level to match the water level on the other side and pass… it was pretty cool!! When we reached Mohan aajoba’s home, we were quite jet lagged. After a cup of tea and some cookies we went off to our room and slept. After a quick nap and freshening up; we were served with amazing home cooked Kheema with some pita bread for lunch. Naluaaji just kept working thru the day with unparalleled enthusiasm and made delicious food. Post lunch me and Naluaaji we went for a walk around the neighborhood where we discussed the socio-economic problems faced by England today while appreciating the beautiful green landscape around. Later I dragged Soumitra out for a walk as I had to show him how green it was and how much peace it brought to a Mumbaikar’s eyes. After an hour long stroll & some photo clicking we returned home with some hand-picked blackberries we found in the area. The evening was spent at home with Soumitra’s Mavshis& Mama and their spouses & kids. Beautiful, mad, loving family! 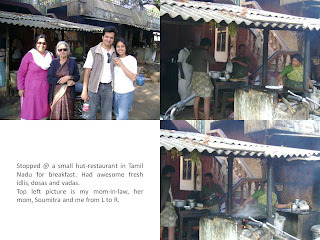 We had a gala time with them and of course there was Naluaaji’s delicious food. Vivinmama and Mohan aajoba dropped us at the bus station where we were to catch our bus for London. We checked into our B&B @ about noon which was at a walkable distance from Victoria coach station where the bus dropped us off. It seriously was the smallest size of hotel room and bathroom I have ever seen. Apparently all the B&Bs in London have rooms this size. 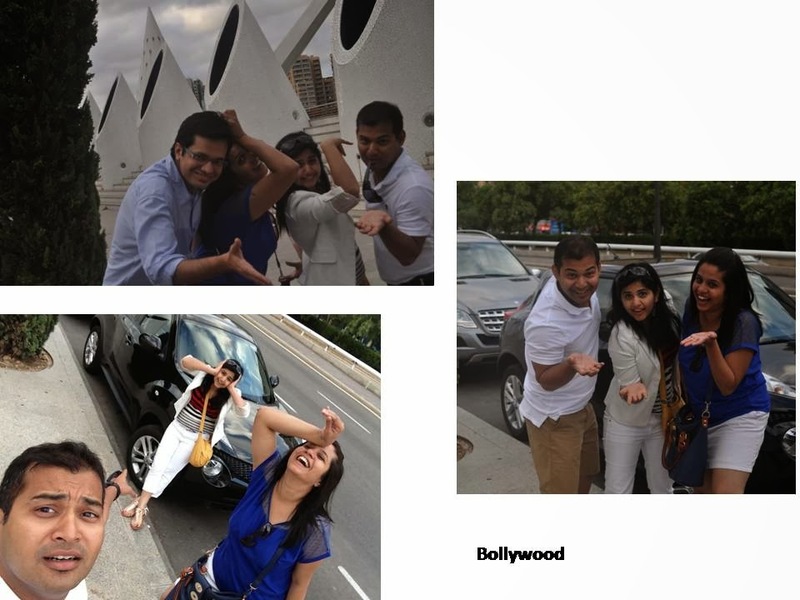 We met our friends Amit (AK) and Mayuri (MJ) after 2 years & it was very exciting as we had planned this whole trip together. 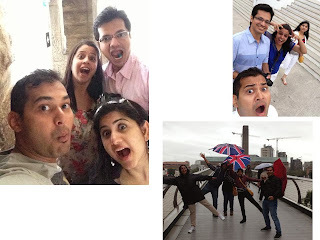 During the London part of the trip we were being accompanied by Ak’s sis Amrita and her husband Shreyas. Lovely couple, also locals so being with them saved us time especially on the first day. After picking up our London pass at charring cross street & a salty pizza lunch we saw Westminster abbey and Big ben from outside and then we headed to the tower of London. Tower of London is a beautiful building at an even more beautiful setting along the river Thames with the view of the tower bridge. Various buildings within the tower of London describe how this was used as a jail and torture house, couldn’t care less about it. We really would have liked to see crown jewels in the building but the line with about 80 people was quite demotivating and we decided against waiting. Later we headed to the tower bridge. Went to the top most portion of the bridge that holds exhibition of all the important bridges from the world. We didn't spend much time looking at the exhibits instead enjoyed the view of London from the height and got out. We had dinner reservation at the Oblix restaurant at the Shard for 6:30PM and we headed back to our tinny-tiny B&B room to dress up. Reached Oblix a little late but it didn’t matter as we had not missed the sunset so we could get photos of London before and after sunset just as planned. We had a sumptuous dinner with bottles of wine while being accompanied by good friends…overall good fun!! Later we went to Piccadilly square and grabbed last drink at an English pub. After the St. Paul’s cathedral & super wobbly legs for about 5min, we started moving towards Tate modern building via Millennium Bridge. We did not spend much time at Tate as we had some more targets to achieve before the end of the day. We checked out some models for the expansion of the Tate modern building designed by the architectural firm Herzog & De Meuron to be completed by 2015. Later we visited the Shakespeare’s Globe theater. For some reason it looked really small from the photos I had seen online. Our guide provided us with some fun facts about the theater in a 20min tour. Last touristy thing of the night was the Thames river cruise which was quite short and dropped us at the Tower of London. We got the shorter version of the cruise as it was past 4pm. After the cruise we met with a friend, Pragya and headed to Oxford Street for some shopping for our little girl who was back home. Shopped at H&M and headed to an Italian place for some lovely & fresh food. Soumitra landed up drinking almost a bottle of wine… got super drunk and super funny!! By the time we were done, we were quite exhausted and were ready to hit the sack. We got back to the B&B by 11:30ish. We could hardly get any sleep as we were scheduled to catch a bus to Gatwick at 2:30am from the Victoria bus station for our flight to Barcelona. We spent about 2 ½ hours at the airport and 2 hours inside the plane waiting for the take-off. Due to some technical problems in the air traffic control in France, our flight was delayed by 2 hours. We reached Barcelona hostel at 1pm instead of 11am. Due to the delay we had to rush to the pre-booked first destination La Pedrera by architect Antonio Gaudi. The building is an apartment block with 4 courtyards. His style of work is very unique and is inspired from the beautiful forms from the nature. While on the tour of La Pedrera, we bumped into AK & MJ as everything was booked together except the flights. After La Pedrera we were scheduled to visit Sagrada Familia church, the most famous work by the same architect. Construction of this magnificent building had begun about 130 years ago and is still on and is expected to be finished after 20 more years. While in architecture school, all of us had seen the photos of this building but never ever did we get the massive scale till we stepped into the church. We were speechless seeing the scale of it. We instantly realized how pointless it was to photograph this outstanding building and how you just could not capture the scale. But obviously to store it better in our memory we landed up clicking tons of photos. We went up one of the towers from high up we got a good view of the city. This church is a must see and seeing it on the first day added a frill of curiosity as to what more this city will offer. Later we went to a nearby restaurant to try some Paella, a dish made out of rice, meat or seafood and some sauces. Delicious preparation of seafood and meat paella. Later we went off to the hotel to catch some sleep as we had plans of exploring the much talked about night life of Barcelona. After good 2-3 hours of sleep; we headed to the “Las Rambles’’. The mood on this street is insanely energetic thru the day but the night brought out even more color to this street. It is a very wide pedestrian street with single lane, one way vehicular roads on both the sides. This street has food stalls, seating and souvenir shops on both the sides of the pedestrian walkway. At night you come across a lot of Indian/Pakistani guys offering you free entry in some club or the other but we were smart enough to not fall for some scam. After hitting 2 clubs at Las Rambles we headed towards the beach in search of a better place to party. AK on his GPS found a good place called Opium Mar and we went straight to the same. We were more than glad to be there, it was a huge club with good crowd, amazing music, and good dance floor and above all it opened on the beach. Except the fact that the drinks were a bit diluted and somebody tried to steal from MJ’s purse on the dance floor, we had a very good time. After dancing thru the night we got back to the hostel at around 4:30ish in the morning. Left our hostel and headed to the Museu Picasso in the gothic quarter area of Barcelona. This is an old neighborhood of Barcelona and has residential of about g+3/4 storey buildings along narrow lanes. The floors of all the buildings host commercial activities like shops, cafes, restaurants. Me and Soumitra went to the Museu Picasso as we had pre-booked tickets and decided to meet AK, MJ at the Palau Guell at 2PM which was at a walking distance from Museu Picasso. The Meseu Picasso holds 4000 of Picasso’s original works out of which 400 are displayed for the public viewing. An audio guide is recommended for an extra cost as the guide not only provides you a peek into Picasso’s life but also has information about each displayed art work including some pottery work displayed. The gallery displays wide variety of paintings right from Picasso’s formative years as a child to his later age. A lot of paintings from the cubist period and the war period were not seen and that was a little disappointing for us. But overall it was worth a visit and was definitely an enriching experience. Later due to some confusion, we could not meet AK & MJ for the entire day and landed up going to different places. 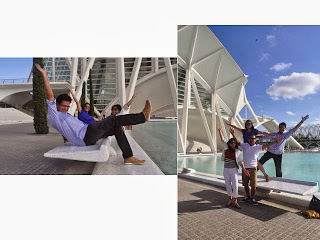 We covered Palau Guell and Park Guell whereas they went to Mountjuic. Palau Guell is a castle designed by Antonio Gaudi. Gaudi has designed this building giving extreme importance to the intricate details of the metal grill work all over the building. The gates, the railings, the high ceilings, meticulous ceiling design to hide certain structural members, the light drawing punctures in the ceramic tile ceiling…. It’s breathtaking!! Later we headed to the Park Guell, a park designed on a hill by Gaudi. Huge site with a stepped park that takes you up and gives a view of the city right up to the coast. 4 of us left for the airport to rent a car to travel to Valencia. As per our pre-trip online research, renting a car was the cheapest option to cover any excursions from Barcelona. What the online research didn’t tell us was that it would cost 40 Euros one-way toll to Valencia and the overnight parking in Barcelona would be 42 Euros. 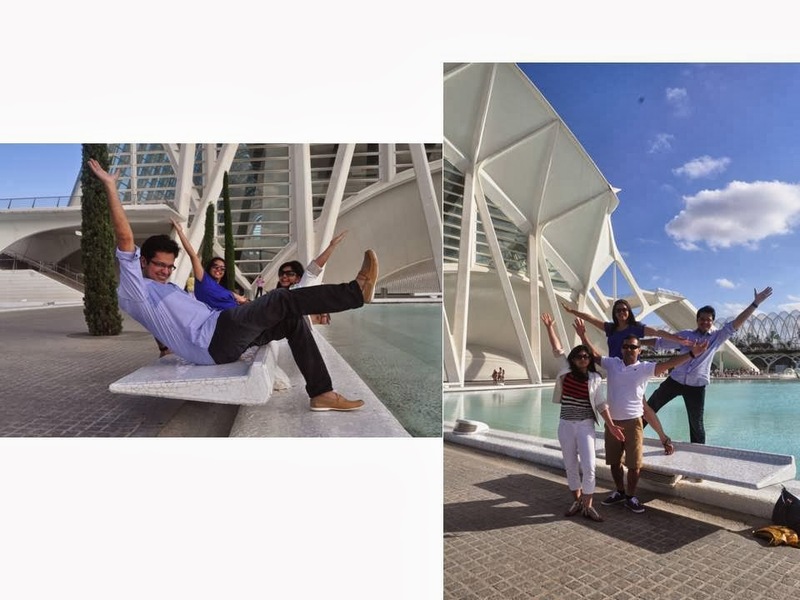 Other that the 40 Euro toll shock, the trip to Valencia was more than worth it as soon as we saw the Art & Science centre designed by engineer turned architect Calatrava. Calatrava’s style of design resembled Gaudi’s to a large extent. His work too is largely inspired from the forms in the nature. We spent good 3-4 hours photographing around the area, had a bottle of wine at a restaurant in the Art centre and headed back to Barcelona. Later the 4 of us drove to the mountain ranges of Montserrat. Very picturesque and unusual mountain ranges with monasteries built at the mountain top. Funicular train took us up to the higher ranges of the mountains from where we could enjoy beautiful view. After Montserrat AK & MJ headed to the airport to fly back to London and we went to the Barcelona downtown. After catching some exhibition in the area, we headed back to the hostel. Grabbed a great seafood paella and a succulent Iberian ham dinner…yum yum!! Last day of the trip. Both of us headed to the Montjduic. Firstly, we visited the famous Barcelona Pavillion designed by the architect Mies Van de Rohe. It is a modern building built during the year 1929. One has to appreciate the architecture of the building understanding what a groundbreaking building this must have been at the time. Later we headed to the Pablo Espanol. It is a mock Spanish village built for tourists. It is large and well built with loads of shopping on both the sides of the pedestrian walkways. We did a little wine shopping, roamed around and headed back to catch our flight to Mumbai. We started our journey back with more than contented hearts!! 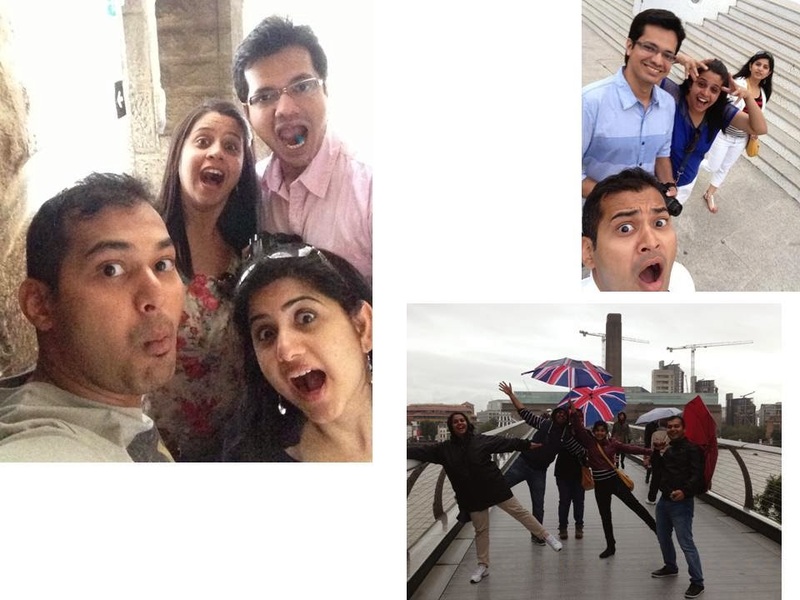 Coming up are just some mad photos of all of us.... they have nothing to do with the locations... its just mad!! I am in my 9th month of pregnancy...and if u have ever been pregnant, u know that u get loads of advice from people who have been there, people who r far from there and from those who will never be there. People suggest tons of 'happy', 'calming', 'stress-relieving' thingies...yoga, meditation, reading, certain music, certain movies. Luckily for me, I had the best prergnancy.. no stress, no tensions, working from home as per my convenience...it was the best! I pretty much did everything I thoroughly enjoyed with the simple logic that in these special days, if I am happy the baby is bound to be happy. COVE Architects is a young and growing Design + Project Management firm founded by Soumitra Shende and Uma Joshi in year 2009. After earning their bachelors degree in Architecture, the duo went to USA to pursue their masters in Healthcare Architecture and Construction Management respectively. After working for internationally renowned firms like HKS, Inc. and Beck Group, headquartered in Dallas, Texas both returned home to start their entrepreneurial venture named as COVE Architects. We at COVE Architects, operate with a very simple philosophy: We listen carefully to our client’s needs and deliver most innovative design and project management solutions that are also sustainable. At COVE Architects, sustainability is an essential part of everything we do. We believe that sustainable design practice will not only benefit the society and environment but also provide direct financial returns to our clients. We provide comprehensive architectural services which include conceptual and schematic design, design development and construction documentation, construction contract administration. We encourage use of latest building technology to better serve our clients. Market Sectors: Residential, Commercial, Healthcare, Hospitality, Retail & Education. We offer design build solutions for your interior environment. We focus on simplicity of planning for enhanced efficiency. Innovative materials and cost effective technologies are used to satisfy user needs. Our Project Management services include time, cost, safety and quality management as well as planning. It will also include defining responsibilities, organizing and leading by implementing project controls, holding consultant and contractor meetings and foreseeing elements of design and construction which are likely to give rise to disputes. We believe in implementing sustainable construction practices. Leadership in Energy and Environmental Design (LEED Rating system) is one of the important measures to achieve this goal. We have in-house LEED Accredited Professionals who will guide you throughout the LEED certification process for your project. We can offer LEED consultancy services either independently or integrate them with Architectural / Interior design. Domain of Architecture practice is continuously evolving its tools and work methods. We undertake outsourced CAD work, Building Information Modeling (BIM) implementation projects using REVIT Architecture as well as 3D rendering assignments. I am currently staying in Bangalore which is kind of the center of southern India and so makes it easier to travel around by car. 26th Jan was a Monday and so we got a long weekend to travel. 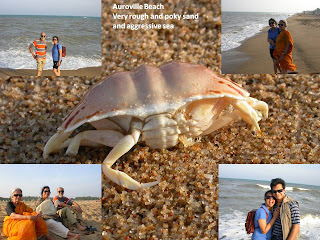 We decided to take a trip to Pondicherry as it is only 300Kms from Bangalore. With a good road it should take something like 3-4 hours but with the potholes it almost took double of that. People in south India don’t seem to believe in any kind of traffic rules and probably think that you have to be a chicken to follow a few. There was a point when we were not sure if we were a left hand drive country or right. The highways in Tamil Nadu are very well maintained; the bumpy ride started when we left the highway and went on to drive thru the little villages of Tamil Nadu towards Pondy. We stopped at a roadside shade in one of the villages where they were making fresh breakfast of idlis, dosas and vadas. It was yumm…mmy. We passed Thiruannamalai on the way and saw a huge temple complex and decided to pay a visit on the way back. 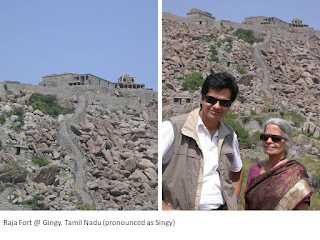 At Gingy (pronounced as Singy) we came across an old township/fort, took some pictures and stuff but didn’t really climb the mountains and visit the fort. 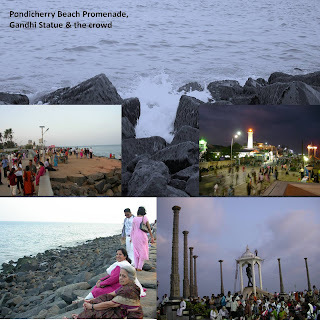 After lunch and a nap at the Hotel Atithi, Pondicherry we set out to check out the Pondy beach. It was breathtaking blue water; you pretty much can’t see anything on the horizon. We walked, sat, chit-chatted along the beach for a while. During the walk around town, we came across a lot of interesting shops carrying artwork, antiques etc. Even found a fun café (if I remember right, the name of that café was Bindaas café) to sip a cup of coffee or just to read a book in the evening. This place was an art gallery with a dance/tai-chi/Yoga activity center in the backyard and the café on the terrace. Next day we started off by visiting Aurobindo ashram, nice little place with a small, cramped garden with amazingly beautiful plants. It has the Samadhi of Guru Aurobindo which is always very well decorated by flowers and has people praying and meditating around it. 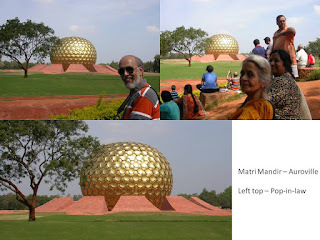 Next stop was Auroville, the most secluded yet famed spot near Pondy. Auroville is serene and peaceful, it sure tempts you to attend at least one workshop to see it in detail otherwise there are too many restrictions as to what you can see as a tourist. We visited Matri Mandir but the whole fun is to go inside and meditate but obviously that entry is highly restricted. 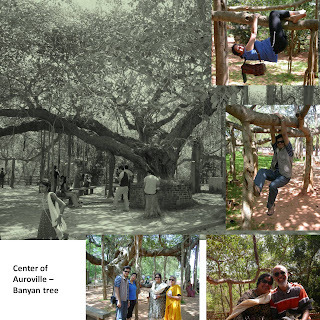 The picture of the Banyan tree below is the center of Auroville, it is much older than Auroville and has formed a number of mini-banyans around itself. We tried our hand at some monkey business too. Later we drove to Auroville beach; the sand was very rough and harsh on feet. Water was very forceful and violent making it more fun to get wet. This is also a must see beach just like Pondy beach. Next day morning we got up early to head to the beach to check out sunrise but to our surprise the sky was beautiful red just before sunrise and it turned dark, blue sort of gloomy after sunrise. 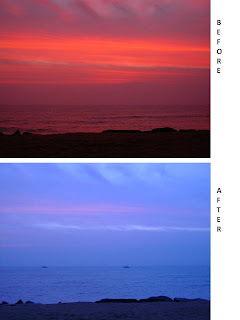 The shades of red color vanished from the sky making us think that it was sunrise gone backwards. On the way back we did visit the Thiruannamalai temple, it was a large temple complex with beautiful white Gopurams. We did not stand in lines for any darshan we just checked out the temple and pushed off. Hotel Atithi is top-notch for stay, service and food. DO NOT even enter the restaurant called Rendezvous, it is worse than pathetic. If planning for a dinner by the pondy beach, don’t miss Hotel Ajatha, the food is not bad but you pretty much pay for the view which is out of this world. Started walking randomly this morning with the aim to explore Bangalore. Took the exploration buddy along, the camera. I started walking from Houdin Road where I currently stay towards Ulsoor Lake and came across this Gurudwara on the left. Later reached Trinity Circle, a very busy junction where 3 major roads intersect - the Ulsoor road, M.G. Road and the Airport road. Currently a Metro connection is being built in the city and so the construction is creating a traffic ruckus. Bangalorians don’t seem to believe in the traffic rules as it is and so this definitely adds to the royal mess. The Cowboy traffic cops hardly manage the traffic and that is when you remember how efficient Mumbai Mamus are. Most of the roads here have pedestrian walkways on 2 sides. Large tree trunks which are larger than the walkways are pretty common. J. All you have to do is duck and walk…simple as that. The one in the picture below doesn’t even allow ducking. Cauvery – very famous shop for handicrafts, silk, silver etc. This picture is of a shop outside Cauvery which sells very bright and colorful wooden toys. You will see these vibrant colorful temples all over Bangalore, they spread a very gripping sandalwood smell in the surroundings. On my way back I came thru Ulsoor market, small lane filled with shops on both the sides, it gets very crowded in the evenings. I am a partner in a construction firm by the name COVE Architects in Mumbai, India.